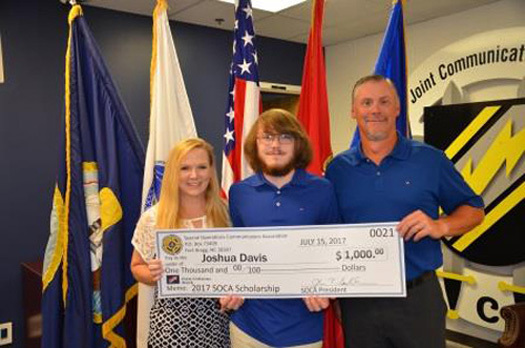 We are pleased to announce one of the many initiatives that the Special Operations Communicators Association started twelve years ago, The Annual Special Operations Communicators Association (SOCA) Scholarship. 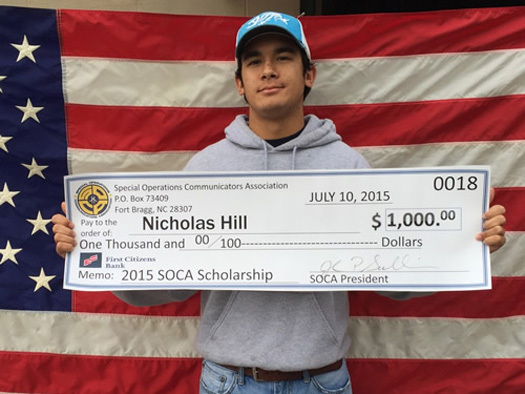 SOCA will offer two college scholarships for full time degree-seeking college students, valued at $1,000 each, to deserving spouses and college-aged child dependents of SOCA members. Applicants are asked to submit a one to two page essay on the topic posted below. A committee, assigned by the SOCA Board of Officers will select from all of the qualified entries to award the two scholarships. It is SOCA’s goal to show their appreciation to those who have contributed and sacrificed so much in support of our country’s national objectives. SOCA thanks all of our communicators, veterans and your families for all that you have done. Before filling out the sholarship application; be sure to have your essay in a word document so you can upload it into the application and also have your last transcript saved as a digital file and ready to upload it in the blocks provided. 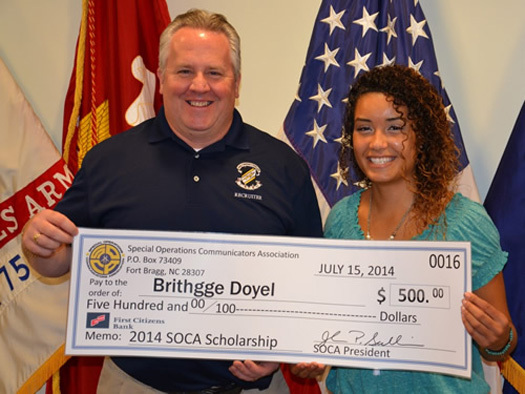 The scholarship committee will select from all of the qualified entries to award the two $1,000 scholarships. Entries must be received by July 1, 2019. The winners will be notified before July 15, 2019 and announced on this page. - What do you think the Veterans Administration and/or the military should be doing to address the issue of rising numbers of veteran suicides? - Only SOCA members spouses or college-aged children applications will be eligible. - Spouse must be a full-time degree-seeking college student. - Child must be a full-time degree-seeking college student. If the applicant is a graduating High School Senior, the applicant must have declared enrollment into a selected college. - If scholarship is awarded and either the spouse or child drops out of said college, the entire amount of the award is to be turned back into SOCA for re-issuance to another deserving applicant. - When available, the winners for this year’s awards will be required to take a presentation photo with the SOCA President and authorize the posting to the SOCA website for publicity purposes. 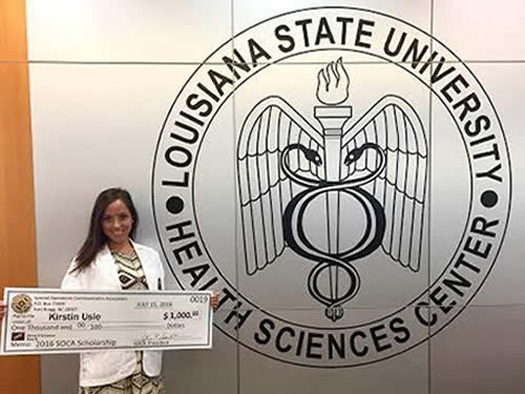 If applicant does not live in the local area, we will send you the over-sized check and you agree to have your picture taken holding it up in front of you. 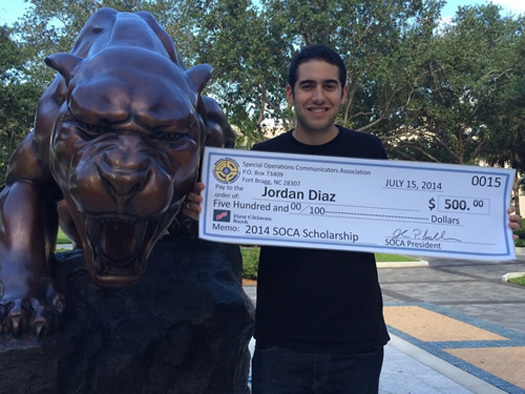 - Scholarship check will be directly mailed to the college registrar's office in your name. 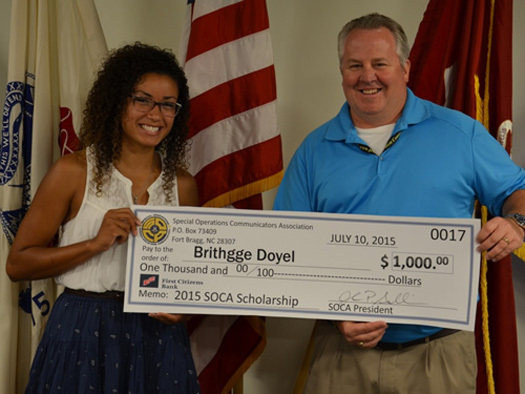 Thank you for your interest in the SOCA Scholarship Program. We take great pride in supporting the family members of our Special Operations Communicators that also sacrifice so much in their daily lives. By filling out this form you are agreeing to the stated terms and conditions listed above on the Scholarship page. Good luck.